Directions Read and follow the insert. Store between 50 degrees F and 80 degrees F.
Uses Nothing protects better, nothing covers gray better, time after time. * Before: Protective pre-color serum helps protect fragile areas of the hair, particularly dry ends, and helps prevent damage. 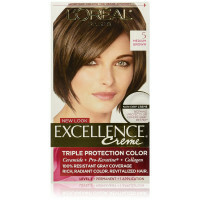 During: Protective Pro-Keratine Color Crème beautifully colors hair with 100% long-lasting gray coverage. After: Protective Conditioning Treatment deeply conditions and helps protect your hair after and in-between coloring. 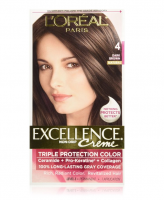 Result: Hair rediscovers its youthful look giving you rich, radiant color. Not a single gray in sight. Contains: Protective Pre-Color Serum, Protective Permanent Color Crème, Protective Developer Crème; Protective Conditioning Treatment, Excellence Color Comb, Salon Gloves, Step-by-Step Guide. 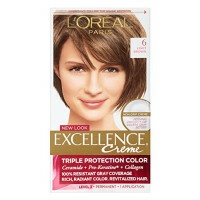 Warnings IMPORTANT: HAIRCOLOR CAN CAUSE AN ALLERGIC REACTION WHICH, IN CERTAIN RARE CASES, CAN BE SEVERE. 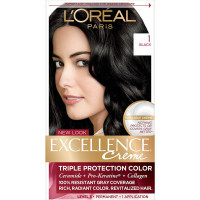 THEREFORE, YOU MUST FOLLOW THESE PRECAUTIONS: DO NOT USE IF: You have already had a reaction to a hair color product. You have a sensitive, itchy or damaged scalp. IF YOU HAVE A TATTOO, the risks of allergic reaction may be increased. PERFORM A SKIN ALLERGY TEST 48 HOURS BEFORE EACH USE OF THIS PRODUCT (see insert). REMEMBER TO BUY YOUR PRODUCT 2 DAYS AHEAD OF TIME. Avoid contact of this product with eyes and skin. If product gets into eyes, rinse immediately. Wear gloves provided in kit. 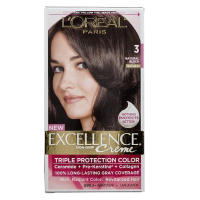 Thoroughly rinse hair after application. Do not use over compound henna or progressive color. Keep product out of the reach of children. Do not apply on children. THIS PRODUCT CONTAINS INGREDIENTS WHICH MAY CAUSE SKIN IRRITATION ON CERTAIN INDIVIDUALS AND A PRELIMINARY TEST ACCORDING TO ACCOMPANYING DIRECTIONS SHOULD FIRST BE MADE. THIS PRODUCT MUST NOT BE USED FOR DYEING THE EYELASHES OR EYEBROWS; TO DO SO MAY CAUSE BLINDNESS.